Last weekend we headed out on our annual family backpacking trip and this time we decided to shake things up a bit. 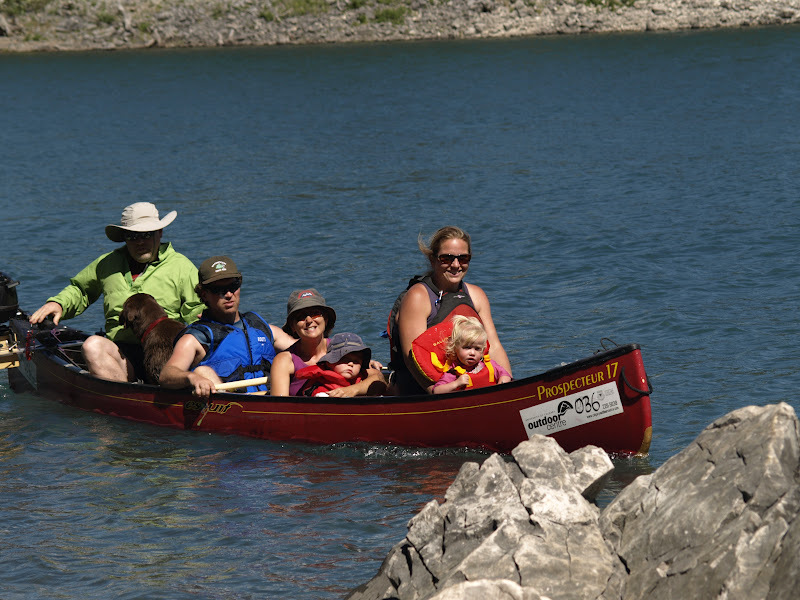 Rather than bringing Chariots to help ferry gear (and kids) we decided to bring canoes. Two canoes to be exact. Along with 7 adults, 1 teenager, 3 preschoolers, 1 toddler, a dog, and a backcountry cat. Yep, you read that right - our friends brought their cat! Isn't that the coolest thing (or strangest anyway) you've ever heard of? I was skeptical at first, but the cat was right at home running around the campground, feasted on fresh mice all night long, and never strayed too far away from our campsites. Kitter Kat had no problems riding in an open canoe and other than startling my husband one night while he was off in the trees brushing his teeth, caused no problems. 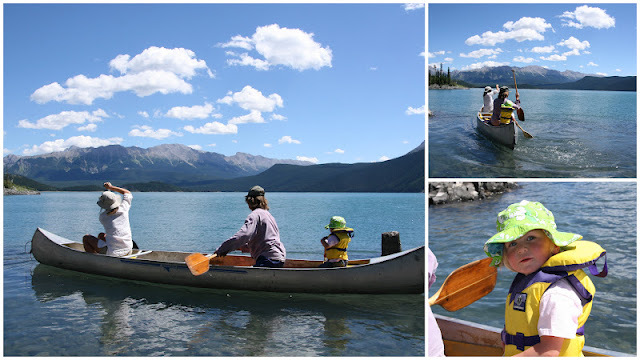 The dads canoed in with the gear while moms and kids all hiked the 3.5 km to the Point Backcountry Campground on Upper Kananaskis Lake. 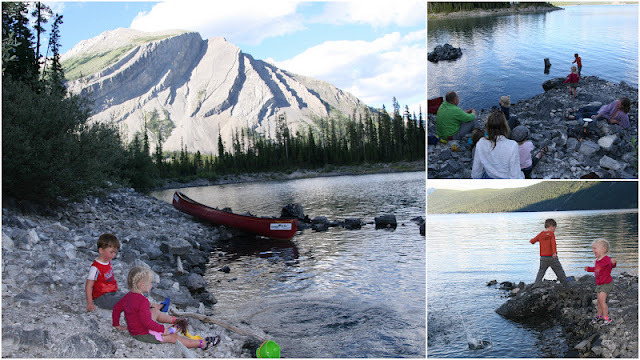 The hike didn't take more than a couple hours and we stopped a couple times for snacks and water play beside the lake. 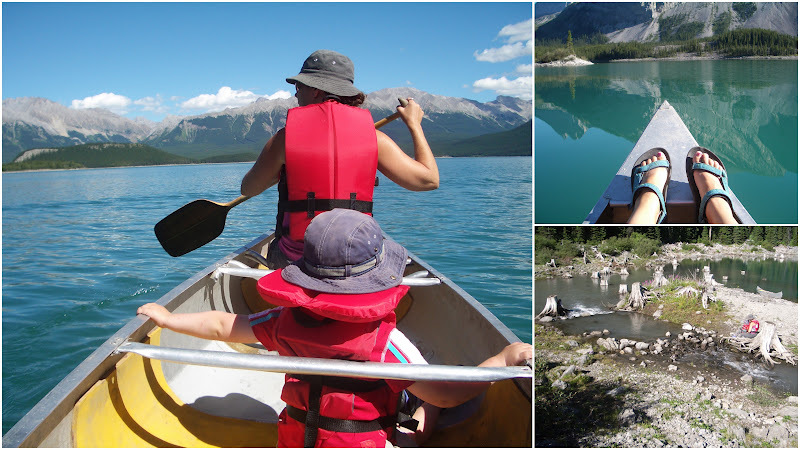 It was a crazy hot weekend in the high 20s the whole time (that's hot for Kananaskis) so we cheated a bit on the way out - allowing all of the kids a ride back. We were fortunate to have a motor on one of the boats and this made it easy to make multiple trips back and forth across the lake. We made a few jokes about the motorized canoe at the beginning of the weekend but once we realized we could ferry 7 people plus a dog to a private island to go swimming, the idea grew quickly on us. It was further appreciated when we didn't have to hike out on Monday. I appreciate a nice day hike with my preschooler as much as the next person but one big hike with little feet per weekend is kinda my limit. 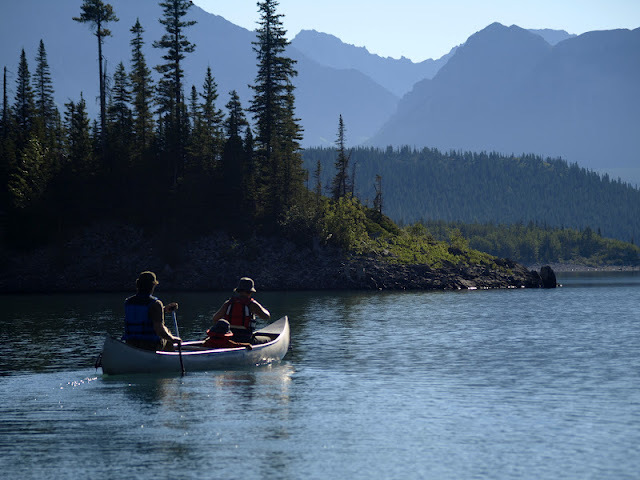 The Point Backcountry Campground is located on scenic Upper Kananaskis Lake. It's accessed via an easy and relatively flat 3.5 km hike from the North Interlakes Day use area. 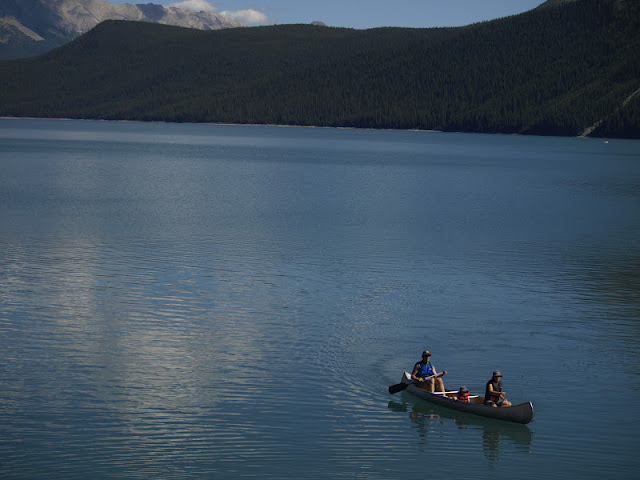 Alternately you can use a canoe or motor boat to reach the campground - and then you can bring lawn chairs, a cooler of beer, a hammock - and whatever luxury items you might want. Next time I'm bringing more wine and real food! Oatmeal and de-hydrated food is fine when you are on a serious backpacking adventure but a trip to the Point calls for pancakes, s'mores and hot dogs. The campground has 20 sites, two giant bins of fire wood, private tables and fire pits at each site, food lockers and two outhouse bathrooms. It's rather unique for a backcountry campground in that each site is very private. In a typical campground, the tent sites would all be together in one section of the campground. Meanwhile picnic tables, lockers or bear hangers, outhouses, and maybe a fire pit would all be clustered in another section. I have to admit that I feel safer knowing that eating and sleeping quarters are separated (bears and all) but it was nice to have your own picnic table per site. I've camped in places where there's only 3 tables to share amongst 8 sites. Not so fun. I found this campground less than ideal for a group such as ours because of the campsite privacy. I was hoping we could all eat, play, and hang out together but this was kind of hard since our four sites were widely spaced apart from each other. I believe some of the sites were closer together but they were already claimed when we arrived. Because of this, we spent a LOT of time with our friends on the beach below site #20 - hands down the most beautiful site in the campground. We had a lot of fun on the beach throwing rocks in the water, swimming (note to self - bring bathing suit next time), and just hanging out. I probably shouldn't admit that we lit a fire on the beach and spent all of our evenings down there but I didn't light it, didn't carry the wood down for it, and take no responsibility for it. (Read the disclaimer for more information on fires at the end of this story.) In our defense, it was the only way we could have a communal fire without disturbing sleeping kids. Most of the adults took turns on parental watch up at the tents each night (our son is freakishly ok by himself in his tent) and we tried to keep the children up as late as possible with s'mores, Jiffy-Pop, and beach-side fun. Note - the lake is very cold!! We also spent hours taking turns in the canoes paddling/riding around the lake. As mentioned above, we fit 7 people plus a dog in the motorized canoe to go over to a private little island that had a good swimming beach. The beach at the Point is very rocky and not as great for small kids. 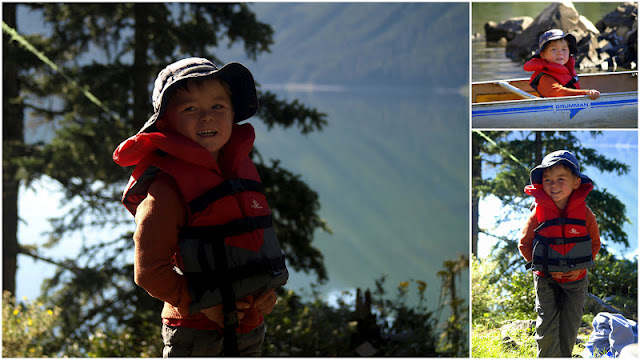 While paddling on the lake we saw bald eagles, heard the call of loons, and discovered neat little places such as the small island near the Hidden Lake outlet that had a spring bubbling up into double waterfalls flowing in opposite directions. We also took a short hike from the Point to a lovely set of waterfalls located about 20 minutes further along the Upper Kananaskis Lake Circuit Trail. The kids thought they were pretty and we even found a friendly marmot. It was an awesome weekend with perfect weather, great friends, and memories built that we will treasure for years to come. Thanks to those who came with us and thanks to our friends Jen and Ashley who ensured I actually had photos of our family on the trip. Several of the photos used in this story (of our family especially) were taken by them. All pets are required to be on leash in a provincial park - at all times. I am pretty sure the regulations were not made with a cat in mind but it should be said that I take no responsibility for whether it was on leash or not as it was not my animal to care for. For more information, follow the link here to the Provincial regulations. Also, despite our bad example, park regulations request that you use the fire pits provided when backcountry camping. For more information on this, follow the link to Minimizing your Impact. Sounds like a great trip, thanks for sharing! I feel inspired to try some camping with our two once our stuff has arrived. We went to Grassi Lakes last Saturday (read about it in your super guide) and had a great time. Stella even managed to fall in the lake! Really appreciate these guides and suggestions on places to go. Thanks Brielle. It's been great getting to know you through outdoor playgroup. Maybe next year you'll be on our backcountry adventure. I have a friend with a cat just like that... though I would never bring him into bear country. To each his own, like you said. Looks like a fun wknd! We'll have to do our own boat trip into here soon. We haven't done much in Kananaskis Country. I went to Upper lakes last weekend! My favorite picnic spot actually. 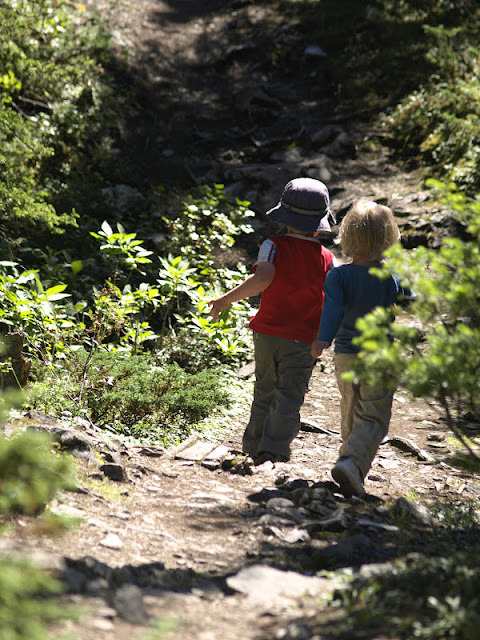 I will have to explore the waterfalls next with the kids- a good excuse to return! Have you camped at the Point before? It would be great with your kids. Do you happen to know how busy the campground is? If we went for a sat night would we get a spot? Thanks for sharing all the wonderful hikes! You have to have a reservation in advance so call Alberta Parks and find out if there's space when you want to go.